GeoSUR opens up GIS resources so they can be used to make better decisions and conserve resources in Latin America and the Caribbean. The development of a regional spatial data infrastructure (SDI) is helping countries in Latin America and the Caribbean address issues such as an increasing population, environmental degradation, climate change, and biodiversity loss as well as responding to floods, earthquakes, and tsunamis. The spatial data needed to respond to these threats is typically produced and managed on the national level. The great challenge now is to transcend national boundaries and promote collaborative efforts to produce, manage, and integrate data at the regional and global levels. A few initiatives have gone beyond the national level: Eurogeographics and Infrastructure for Spatial Information in Europe (INSPIRE), and GeoSUR in Latin America and the Caribbean (LAC). These initiatives have been instrumental in making regional geoinformation available as geoservices that provide accurate and timely information for decision makers. GeoSUR was set up by CAF Development Bank of Latin America, and the Pan American Institute of Geography and History (PAIGH) in 2007 to help the region make sense of its territory and view it from a regional perspective. A network of more than 100 spatial data providers from 26 countries participate in GeoSUR. They have put tens of thousands of maps and other GIS resources on the web, making them available via easy-to-use applications. The deployment of GeoSUR has been a real challenge, given the size and diversity of the region it serves. LAC encompasses 33 countries, 588 million inhabitants living in an area that covers approximately 7.8 million square miles. An area this vast requires the use of digital spatial information available to the public online so forests, coral reefs, infrastructure, soils, and agricultural resources can be monitored. "There is a need in LAC to open up GIS resources for the benefit of our community, as many decisions taken today don't leverage geospatial data, which often results in poor decisions and a waste of resources," said Antonio Juan Sosa, vice president of infrastructure for the CAF. "Much of this information is available today, but it is not within the reach of decision makers." GeoSUR has developed four main components: a regional geoportal, a decentralized network of map services, a regional topographic processing service, and a regional map service. It also furnishes geoprocessing tools for hydro power assessment and flood mapping. The portal features more than 300 Open Geospatial Consortium, Inc. (OGC) compliant services, 14,000 harvested metadata records, 220,000 searchable metadata records, and 110 map viewers. GeoSUR relies on a decentralized system architecture that keeps data close to its producers. The regional components of GeoSUR leverage Esri Geoportal Server for the regional geoportal, ArcGIS for Server for the regional viewer and regional topographic processing service, and ArcGIS Online for the lightweight version of the regional geoportal. Esri technology was selected because it provides a reliable and robust foundation for building a cradle of regional geoservices. All services were built with support from and are operated by the US Geological Survey (USGS) Earth Resources Observation and Science (EROS) Center. The GeoSUR Viewer maintains what is today the biggest collection of online supranational maps of LAC with key holdings of GIS resources in topics such as coral reefs, urban expansion, mangroves, land-use cover, land-cover change, deforestation, habitat loss, forest biomass, climate, hydropower potential, mineral resources, floods, river flow estimations, and infrastructure projects. More than 700 regional datasets produced by 30 international agencies are now available through this mechanism, and some of this information can't be found online elsewhere. Users in the LAC region are putting this information to good use. In February 2014, the floods experienced by the Beni province of Bolivia were the most deadly ever recorded in the region. Typically flood maps would have been generated after the event and would not have been particularly useful for emergency response. However, GeoSUR was able to offer near real-time flood maps of the area, courtesy of its recent collaboration with the Dartmouth Flood Observatory (DFO) of the University of Colorado. Using this information, Bolivian authorities were able to correctly assess the extent of the areas affected, evaluate the negative impacts to environmental and agricultural resources, and establish which towns needed immediate emergency support. GeoSUR is making data available about LAC near real-time as well as historic flood maps and daily estimates of river flow that are obtained using remote-sensing techniques. The new system can monitor other water-related conditions such as the level of reservoirs and unusual river flow in addition to flooding. A recent survey of GeoSUR users shows that 22 percent have used GeoSUR's online tools for decision making. 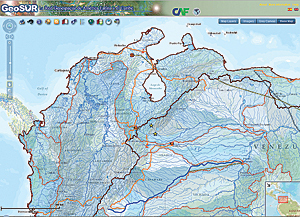 Reported uses include river mapping, modeling landslides and flooding events, mapping slope for agricultural use suitability, emergency relief efforts, watershed analysis, road planning, ecological planning; analysis of school accessibility, expansion of protected areas, impact of new infrastructure, vulnerability to climate change; environmental monitoring in the Andean Amazon region, land-use scenarios; and viewshed analysis for cellular companies. GeoSUR continues to expand into new fields including GIS-based hydropower assessments that allow governments to identify the best locations for building small and medium hydropower plants. These assessments use hydrological and climate data with Shuttle Radar Topography Mission (SRTM) 30-meter digital elevation model (DEM) data that has been edited and improved by the USGS for GeoSUR. Studies have been completed (or are under way) in Brazil, Peru, Argentina, and Bolivia. In Brazil, the São Paulo Energy Secretariat is using the data to promote the incorporation of small and medium hydropower producers into the energy grid. In Peru, authorities are identifying key watersheds that could potentially be sites for developing large hydropower plants that would meet the country's growing energy needs. GeoSUR also supports efforts to harmonize and integrate regional datasets. 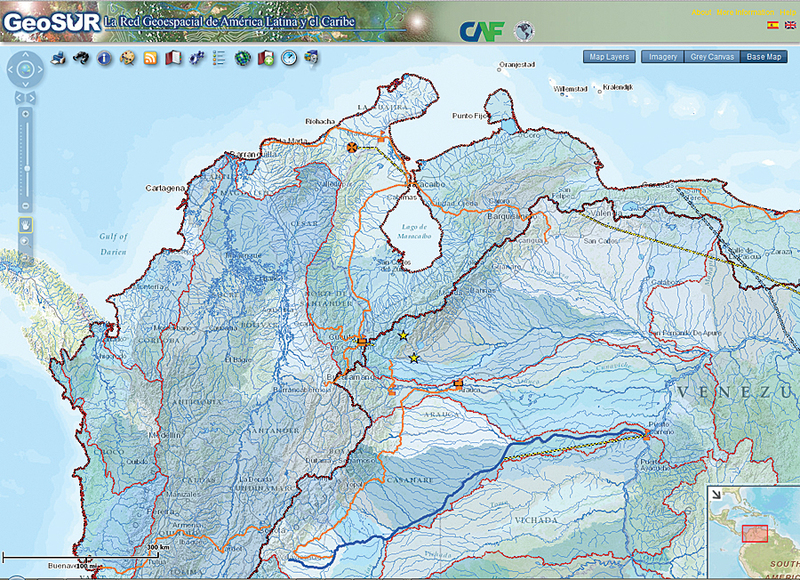 In collaboration with the USGS, PAIGH, and the geographic institutes of Central America, GeoSUR assisted in the development of the first Regional Central American Map at a 1:250,000 scale, which is now available in the GeoSUR Viewer. The project developed methodologies that could be applied to the creation of an integrated Latin American map. GeoSUR partners face technical limitations for building geoservices, such as limited bandwidth, expensive and difficult to replace hardware, lack of scalability, information security issues, and a limited number of information and communication techology specialists. With support from Esri, GeoSUR is helping partners overcome these limitations and migrate their data and services to the cloud. The Geographic Institute of El Salvador was the first mapping agency in LAC to operate a service in the Amazon Cloud using ArcGIS for Server. GeoSUR is helping 10 other partners move to the cloud. These examples show how a regional SDI, such as GeoSUR, can build geoservices and applications with real social benefits. To prosper, national SDIs need to build useful applications with tangible benefits and clear outcomes, lest they remain intellectual exercises and end up losing political support or fall out of favor with the public. "GeoSUR has brought GIS resources much closer to the decision maker and the public, and it can provide a model for building regional SDIs in other areas of the world," said Rodrigo Barriga, secretary general for PAIGH. In 2010, GeoSUR received the Esri Special Achievement in GIS award, and in 2012 received the Esri Venezuela North American Serials Interest Group award, and the Esri President's Award. For more information on GeoSUR, contact Eric van Praag at 58-212-209-6554 (Venezuela).